Automatic capture of the user’s interaction environment for user-adapted interaction and evaluation purposes is an unexplored area in the Web Accessibility research field. 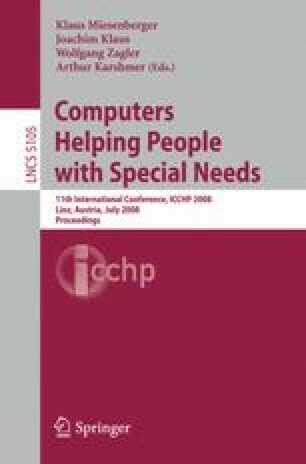 This paper presents an application that collects user data regarding assistive technologies (be either software or hardware) in an unobtrusive way. As a result, CC/PP based profiles are created so that interoperability between components such as evaluation engines or server-side content adaptors can be attained. The implications that versioning issues and the potential user group of a given assistive technology have on the guidelines to apply are also remarked. The major benefit of this approach is that users can perform their tasks avoiding distractions while interacting with the World Wide Web.